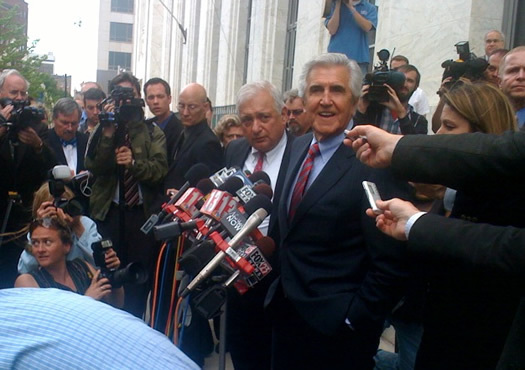 Joe Bruno talking with the media after the sentencing: "I'm proud of my public service." The federal judge in the Joe Bruno case has sentenced the former state Senate majority leader to two years in prison -- and three years of post-release supervision. He's also been ordered to pay $280,000 in restitution. He'll be allowed to stay out on bail until the Supreme Court of the United States rules on its theft of honest services cases. If SCOTUS rules against the theft of honest services laws, Bruno will go free. During his statement in court before the sentence was announced, the TU reports Bruno said: "In my heart and in my mind, I did nothing wrong ... nothing!" Federal prosecutors had been looking for an 8-year sentence. Bruno's attorney's were looking for no jail time and a fine. The two sides had agreed on the restitution. WTEN reports that Bruno headed for Jack's after the sentencing and traffic came to a standstill at Broadway and State as he crossed the street. You can follow tweets about the Bruno sentence through this search. 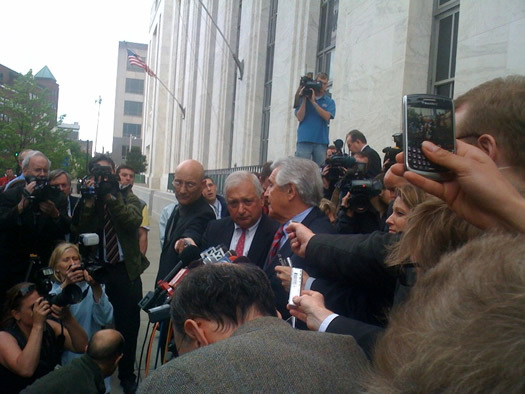 More post-sentencing photos after the jump. So Bruno probably never serves this, and that's okay with me. But supposing he did, two years means what? Eight months? I have the impression that "good behavior" is assured and cuts a sentence by two-thirds -- but don't know where I got that idea. How's this really work? As I understand it: The Sentencing Reform Act of 1984 virtually abolished federal prison parole. And federal prisoners are eligible to earn a maximum of 47 days per year of their sentence for early release by abiding by prison rules and regulations. "traffic came to a standstill at Broadway and State as he crossed the street." and some Van Halen blasting out of car speakers. I'd bet anything he never sees the inside of a jail cell. We should instead concentrate on renaming all his sponsored projects. When is bobble head night at Felon's Field anyway? This just in - Bruno sentenced to live an entire week in Ward Stone's office. His defense calls it "cruel and inhuman punishment".